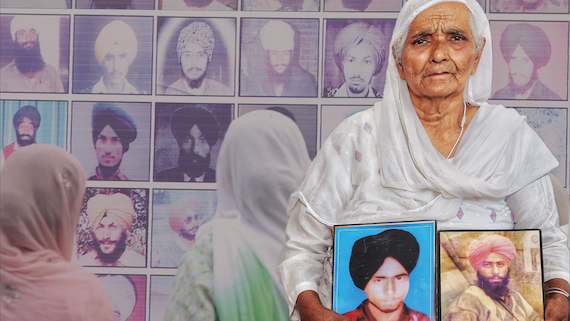 Chandigarh: Punjab government today announced to take back investigation of Beadbi cases from the CBI and hand it over to a proposed Special Investigation Team (SIT) of the Punjab police. Chandigarh, August 28: Punjab Chief Minister Captain Amarinder Singh on Tuesday announced a Special Investigation Team (SIT) of the Punjab Police for time-bound investigation into the Bargari and other sacrilege cases as well as the firing incidents of Behbal Kalan and Kotkapura. He also assured that his government would take immediate action as per the findings and recommendations of SIT, without delay, to ensure that justice is meted out to the innocent victims. The announcement and the assurance came in the Vidhan Sabha after the House unanimously passed a resolution, by voice vote, to withdraw CBI investigations into the cases and get the same probed by an SIT. The resolution was moved by Rural Development Minister Tripat Rajinder Singh Bajwa on request from the Chief Minister, who took the decision after taking cognizance of the sentiment of the majority, including the Congress and the Aam Aadmi Party (AAP) MLAs. The Chief Minister, while concluding the debate on the Justice (Retd) Ranjit Singh Commission report and ATR in the House, said there was no question of going soft on Parkash Singh Badal, whom he blamed squarely for the damage caused to the state and its people with his grave acts of commission and omission. He came down heavily on the SAD leaders, including Parkash Singh Badal, Sukhbir Badal, Harsimrat Kaur Badal, Bikram Singh Majithia and others, for failing to even visit those injured in the police firing in Behbal Kalan and Kotkapura. 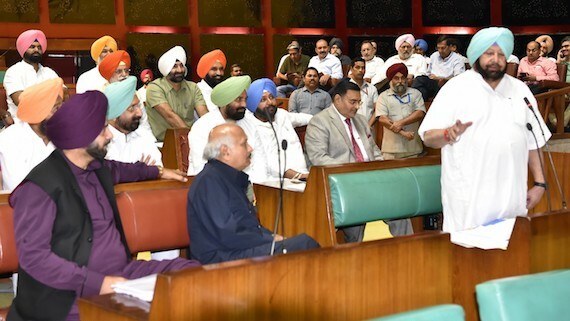 The Chief Minister said the Congress had made an election promise to bring the truth of the Bargari sacrilege case and the subsequent firing incidents to the people of Punjab. He said he had decided to get the incident thoroughly probe when he visited the injured after the incidents. Captain Amarinder lashed out at former Chief Minister Parkash Singh Badal as a coward and liar, who, he had seen from close quarters Badal had lodged false cases against him, said Captain Amarinder, adding he was even turned out of the Assembly and had to be reinstated by the Supreme Court. Referring to Operation Blue Star, he said Parkash Singh Badal was directly to blame for the incident. Whenever there was any scope of negotiation, Badal would sabotage the efforts, said the Chief Minister, adding that he would run away after promising the hardliners of his support. History will be scripted of our times and Badal would not be spared, said Captain Amarinder. The Chief Minister also lashed out at Bikram Singh Majithia, saying nobody knew where he had come from into a family which had a lot of character. Majithia, along with Parkash Badal and Sukhbir Badal, had come together to form a dangerous coteries working against the interests of the state and continuously trying to divide it, he added. On the Bargari and Behbal Kalan incidents, Captain Amarinder pointed out that DGP Saini, on the last day before his retirement, had given a statement that he had spoken to then CM Parkash Badal before the firing incident. He wondered how the then CM could have been sleeping, as claimed by him, at such a grave time for the state. It was not done for a leader to blame his subordinates, said Captain Amarinder, adding that Badal was obviously not a leader in the true sense of the word. The Chief Minister commended the effective and laudable job done by Justice (retd) Ranjit Singh but observed that he himself had stressed the need for more investigations. Earlier, taking part in the debate, Local Government Minister Navjot Singh Sidhu said that former Chief Minister Parkash Singh Badal was a dubious character, at whose behest the barbaric firing had been unleashed in Behbal Kalan, and deserved no mercy. The desecration of the holy Sri Guru Granth Sahib would always haunt Badal, he said, adding that Parkash Singh Badal and his son Sukhbir were dealers not leaders, and could even sell their Panth for their ulterior motives. Sidhu said Sukhbir had a deal with Dera Sacha Sauda Chief to take the Dera support during elections in exchange of permission to run his films in Punjab. Finance Minister Manpreet Singh Badal lashed out at the Badal father-son duo for indulging in communal politics to polarise the society. 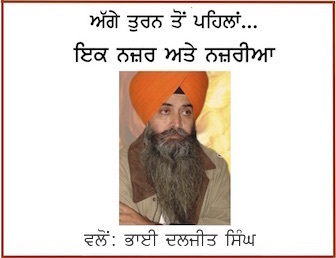 He accused them of sowing the seeds of communal divide in Punjab for the first time by conspiring to allow the Nirankari Samagam on 13th April 1978, despite intelligence reports against holding it in Amritsar, which resulted in the death of 16 Sikhs protesting against the Samagam. They were also to blame for raising the issue of Punjabi Suba and then creating circumstances that led to the phase of terrorism, he added. Manpreet lauded Justice (retd) Ranjit Singh Commission for successful completion of the successful task of bringing out the truth on the sacrilege cases and stressed that the ends of justice will only be met by punishing those involved in this shameful act. Lashing out at Sukhbir Singh Badal, Technical Education Minister Charanjit Singh Channi said that he was hand in glove with the Dera Chief for hatching a conspiracy against Sikhs, which had vitiated the congenial atmosphere of peace and communal harmony in the state. He challenged Sukhbir to visit his native village Badal without security cover, asserting that the former CM would have to face the wrath of his own people for ruining the state. Prisons Minister Sukhjinder Singh Randhawa said the Badals were the real culprits and conspirators behind the Behbal Kalan incident and deserved the severest punishment as their act was unpardonable. He lashed out at Sukhbir Badal for tearing the pages of the report of the Justice Ranjit Singh Commission, which had mentioned Sri Guru Granth Sahib at least 95 times, thus showing total disrespect for the holy scripture. Randhawa also demanded that Parkash Singh Badal be stripped of the honour of ‘Fakhr-e-Kaur’ bestowed by the Jathedar Sri Akal Takht Sahib as he had indulged in his anti-Sikh and anti-panthic activities, for which he actually deserves the title of ‘Gaddar-e-Kaum’-trainer of Panth. He urged Captain Amarinder Singh to get a case registered against Badals under section 295-A of the IPC. Rural Development Minister Tripat Rajinder Singh Bajwa said there was no provocation for the police firing at Behbal Kalan and Kotkapura, and the incidents were clearly aimed at creating divisiveness in the society. The Badals deserved no mercy for the crimes they had committed against the people of Punjab, he added. Bajwa also castigated former DGP Sumedh Saini and accused him of several extra judicial killings. Both Randhawa and Bajwa urged the Chief Minister to withdraw investigations into the sacrilege cases from CBI as the state police’s SIT was fully capable of handling the same. Aam Aadmi Party (AAP) MLA from Mullanpur, HS Phoolka, urged the Chief Minister not to spare both senior and junior Badal for their alleged involvement in the Behbal Kalan. He lauded Captain Amarinder for showing exemplary courage by resigning in 1984 over the 1984 riots. He said the people had the highest hopes of Captain Amarinder to teach the Badals a lesson for their tyrannical act in Behbal Kalan. Phoolka also urged the Chief Minister to get the Nakodar incident of sacrilege of Sri Guru Granth Sahib investigated. He said there was dire need to set up an exclusive court for hearing sacrilege cases on day-to-day basis. Leader of Opposition Harpal Cheema also urged the Chief Minister to hand over the sacrilege cases back to the Punjab Police with directives for time-bound inquiry, since the CBI was under the control of the central government under BJP – an ally of SAD. He moved a resolution seeking apology by the Centre for failing to take any action against the guilty, which was unanimously passed by the House. Patti MLA Harminder Singh Gill said that the desecration of the holy Sri Guru Granth Sahib had hurt the religious sentiments of people around the world. He accused the Badals of stooping to the lowest levels to further their political ambitions by exploiting the sentiments of the Sikhs in the name of the Panth. They were controlling Sikh institutions like the SGPC and even the Sri Akal Takht Sahib to pursue their vested interests, he said. MLA Faridkot Kushaldeep Singh Dhillon, in whose district the Behbal Kalan firing had taken place, lambasted the Akalis for conspiring in this tragic incident of defiling the holy Sri Guru Granth Sahib Ji. The people of Punjab would never forgive Sukhbir, he said, lambasting the SAD president for using religion for political gains to garner votes. He also targeted the Badals over their relations with Dera Chief Ram Rahim Singh, and attacked them for shying away from discussion on such a vital issue. Amarinder Singh Raja Warring, MLA Gidderbaha, while demanding harsh punishment for the guilty indicted by Justice Ranjit Singh Commission, said that those who have dared to exploit religious sentiments for vote bank politics must be dealt with a heavy hand. He vehemently flayed Sukhbir, then Home Minister, for remaining in deep slumber for 116 days after the disappearance of the Sri Guru Granth Sahib, and then suddenly waking up to unleash atrocities on the innocent people protesting against the desecration at Kotkapura. Why Anti-Sikh Indian Media was so irked over Arvind Kejriwal's visit to Bhai Dhadrianwale?